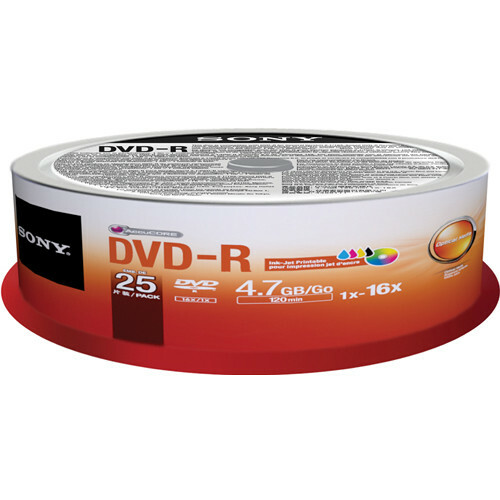 This DVD-R 4.7GB Recordable Printable Media (25 Discs, Spindle) from Sony contains 25 discs, which can hold 4.7 GB of data and are compatible for playback with most DVD video players and DVD-ROM PC drives. Each disc is capable of write speeds up to 16x and can be used to store video, audio, photos, multimedia and other data files. Box Dimensions (LxWxH) 5.3 x 5.3 x 2.0"
DVD-R 4.7GB Recordable Printable Media (25 Discs, Spindle) is rated 5.0 out of 5 by 3.